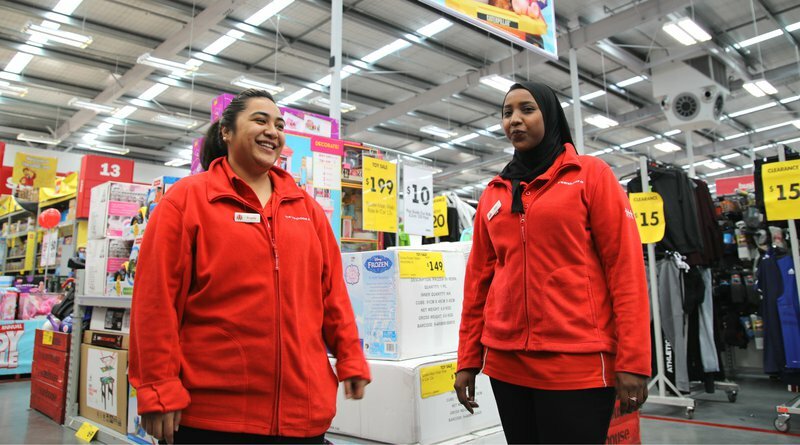 It's been a long journey for former refugee, Awo, to get where she is; now she's flourishing in a job found with support from Red Cross Pathways to Employment and The Warehouse. It’s a busy morning at The Warehouse in Mt Roskill. 21-year-old Awo greets a steady stream of customers with a big smile and friendly chatter as they make their way through her checkout. It’s been a long journey for Awo to get to where she is, one that’s been helped along by a relationship between The Warehouse and Red Cross Pathways to Employment. Born in Somalia, Awo and her family were forced to flee to Ethiopia when she was a child due to violent conflict. They arrived in New Zealand under the refugee quota programme in 2011. Having never received a formal education, Awo was faced with the prospect of learning a new language and starting her schooling. She excelled at both and is now fluent in English and an excellent communicator. Toward the end of 2016, Awo began looking for work with help from Red Cross Pathways to Employment, a programme which helps people from refugee backgrounds find work in New Zealand. From the outset, she had her heart set on working in retail. “I was really interested in working at The Warehouse because my mum usually shops here,” she says. The Pathways to Employment team saw a perfect opportunity for her through a relationship which was initiated in September last year. The recruitment team at The Warehouse was trying to meet the demands of the Christmas rush and needed to hire around 2,000 staff. They implemented a process with Red Cross which continues today. If the Pathways to Employment teams finds a job advertisement that might suite one of the former refugees they’re working with, they send the person’s CV to the recruitment team at The Warehouse’s head office. If the candidate is thought to be suitable, the information is passed on to the in-store manager for consideration. Angela Akeli is a team leader at the Mt Roskill store. She was one of the first managers to benefit from this process during a recruitment for casual staff. “The first time I met Awo [for the interview] I thought she was really quiet, I couldn’t even hear her answers to some of the questions,” says Angela laughing. Despite some concerns that Awo would struggle when it came to interacting with customers, Angela decided to give her a go. “I just thought that you’ve got to give people a chance, you just never know,” she says. Her gut feeling proved to be correct and Awo flourished in the role. Angela started her off in the footwear team and was impressed by Awo’s diligence. Now she’s been trained in most aspects of the store and has recently started working on the checkouts. “Her first time on checkouts she was really nervous so we put her on during a slow period, but now she’s a pro on them,” says Angela. Awo is proving to be an inspiration to some of her colleagues too due to her success with in-store fundraising. The Warehouse runs fundraisers where customers are asked if they’d like to buy a badge for $1 to support a chosen charity. “During our last one, Awo came to me and asked for tips on how to approach customers about donating,” says Angela. It’s these sorts of stories The Warehouse and Pathways to Employment is hoping to create more of. Recruitment partner at The Warehouse, Amy Watson, says they’re keen to help Kiwi families flourish and the relationship with Pathways to Employment is helping them to achieve that. The job has certainly been life changing for Awo who has thrived in the role, finding confidence and friendship. “When I started I never even thought I’d be able to work at the checkouts, so now I realise that anything is possible,” says Awo. Our Pathways to Employment teams work with a range of clients from refugee backgrounds who have a wide variety of skills. If you're an employer with an available position, you can contact our Pathways to Employment teams here.